Well, yes I am, and in the sleet, and in the snow, and in the fog, and any other time the other guys are at home sitting on the couch. And that puts me in the lower five percent of all the other fishermen I know who each have at least sixty. No, I’ll fish until dark, and if the fish are biting I’ll keep fishing until they stop or at least until my muscles become so stiff they have to pry my rod out of my cold wet fingers. Not about a fish, not about anything, not ever! No. Can I use your wife? Just shut your pie hole and go to the beer store. Well this is today dammit and they aren’t biting. I caught it in the water, where’d you think? If you can see this middle finger I’m holding up, you’re too close. 11. Or maybe he asks, “How many lures do you need? That’s easy, one more than you. The people I hang out with consider frozen snot to be a fashion statement. Yes, I work very hard, probably harder than you. Do you ever shut up? You get up to work out, I get up to fish. My life is better than yours. 16. And finally, “You know, there’s more to life than fishing. I hope you’ve enjoyed the fishing this fall as much as I have. The weather is unsettled and patterns are changing quickly. 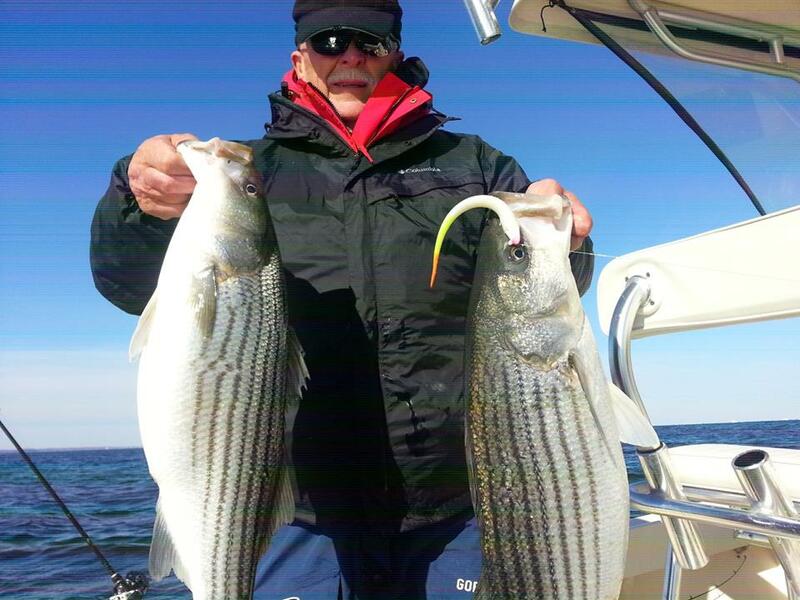 There are still some nice fish in the Chester River on up to Swan Point, but that bite is slowing down a little since water temperatures are dropping fast. 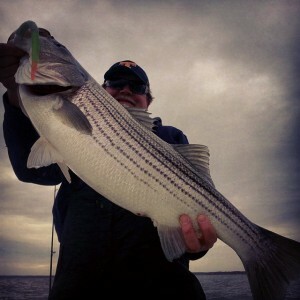 The same goes for the fish in the Choptank – still a few here and there, but better out toward the river mouth. We haven’t seen a consistent big-fish bite in Eastern Bay, but that could change because there is still a lot of bait around, especially out toward Long Point and North of Poplar Island. There are some schools of small fish under little birds and terns, but I’m finding better fish under big birds south and west of Poplar Island. Most of the fish are in the 20-25 inch range but there are enough 30-inch plus fish to make it interesting. The key to bigger fish right now is to find pods of bigger bait. The Maryland portion of the Chesapeake has completely turned over and there is warmer, saltier water down deep. That’s where the better fish are. On the west side of the Bay, temperatures are stable top to bottom so the fish can be at any level. If you see big birds working over an occasional breaking fish, you can expect a good time, but even then the bigger fish are usually closer to the bottom. We’ve yet to see consistent schools of migratory fish north of Point Lookout although there are some bigger fish with sea lice closer to the Virginia line. I expect this cold snap to bring a lot more fish down the Atlantic coast and I won’t be surprised to hear of fish off Ocean City in the next couple of weeks. It’s also getting time for a good bite around the Chesapeake Bay Bridge Tunnel (CBBT). The last couple of years have been slow there, but hope springs eternal that we may see some consistent action there this year. Typically, the first few weeks of December are pretty good at the CBBT. Once those migratory fish get down around the mouth of the Bay, I think we’ll see a few good slugs moving north into the Maryland section of the Bay. The water is getting cold so don’t forget to wear a PFD and keep some dry clothes in your boat or kayak. Good luck jigging the big fish. I think they’ll be here before you know it! Fishing is living, the rest is waiting. Hey Shawn, I really enjoyed the part about temperature and how stratification can effect the bite. Trying to apply that to our home waters. In the way, way upper bay we are still seeing some fish moving south. 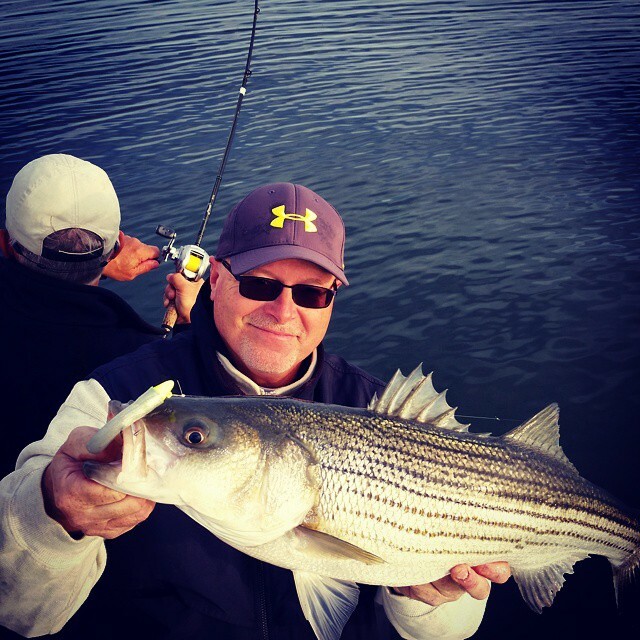 We have caught some as shallow as 6′ and as deep as 34’… the shallow fish were very near deep water on top of a ledge. We plan to explore similar conditions this weekend. Is there a magic temperature when the jig bite shuts down? Was that a hot rodded Ron-Z I saw rigged on one of your rods in the video?